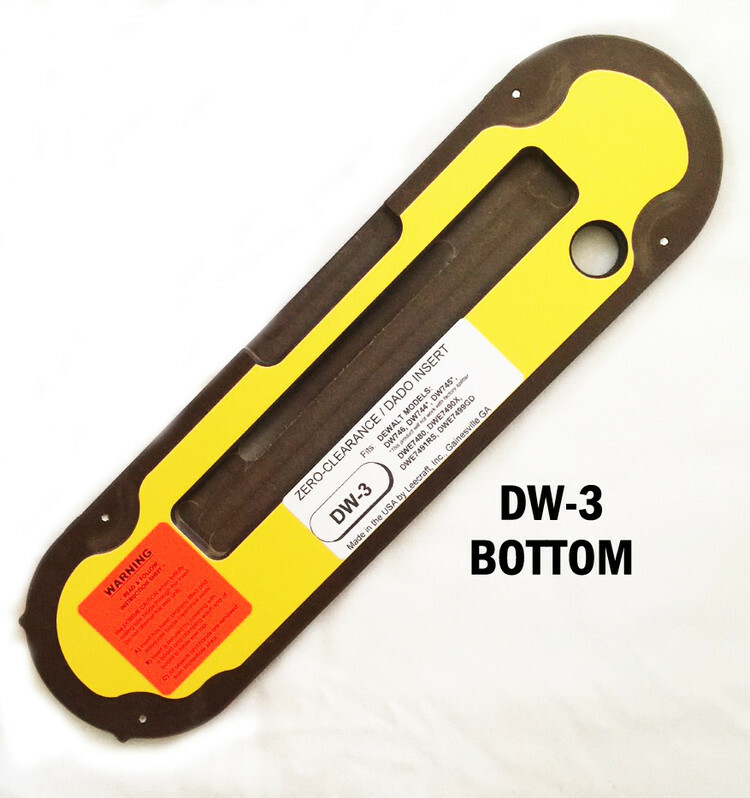 Both inserts measure 13-9/16"L x 3-3/4"W x 1/2"T - Fits DeWalt models DW744, DW745, DW746, DWE7480, DWE7490X, DWE7491RS, DWE7499GD. PLEASE NOTE: Factory splitter/guard on table saw models DW744 & DWE745 is incompatible with DW-2 and DW-3. There isn't enough room for the slot. Please read manufacturer's comments when you click on the inserts. You may consider using a MicroJig Splitter Kit in place of the riving knife that comes with the saw. Fits DeWALT: DW744 & DW745 Portables (factory splitter/guard incompatible with DW-2 insert on these saws) & DW746 (Stationary Saw), DWE7480, DWE7490X, DWE7491RS & DWE7499GD. NOTE FROM THE MANUFACTURER: The old models DW744 & DW745 (portable saws) cannot use factory SPLITTER with DW-2 insert. The required slot (all the way out the back end of the insert) nearly cuts the insert in two, rendering it springy, weak, and unsafe. Think of an old fashioned wooden clothes pin… only held together at one end, and the “legs” can easily be flexed apart or towards each other. Works great for holding clothes on a line, but the opposite of what’s needed for a table saw insert, where you need structural integrity and stability. These are great applications for the Microjig splitter. This may also apply to the DW746, which was a larger contractor type saw with cast iron table; same splitter design. The newer models (all the others) employ a RIVING KNIFE, which allows for a shorter slot, and a structural “bridge” to remain at the back end of the insert. Obviously, the plate becomes weaker and weaker, the smaller this bridge is, as the RK slot gets closer to the edge. The riving knife (RK) slot is essentially an extension of the blade slot, or kerf. The kerf is, of course, created by simply raising the blade through the blank insert, to the maximum elevation. The operator must then extend the kerf (slot) by means of a secondary procedure, to safely create a slot that sufficiently clears the RK. This “secondary procedure” requires a higher level of understanding, skill, and creativity. 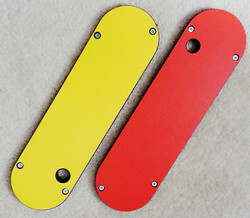 Place insert in table with finger hole at front and starter pocket located over blade. Run leveling screws down until insert is stable and flush with table top. Back out side adjustment screw, then front end adjustment screw to achieve a fit that is snug, yet removable. SPLITTER: DW744: This insert CAN NOT be used with the factory splitter. We recommend purchasing (call for sources) or making a pin or blade type splitter which is mounted to the insert itself, just behind the blade slot. DW746: To use factory splitter, you'll need to cut a short slot at the rear of the insert to accommodate it, using a bandsaw or hacksaw. Leave the "bridge" between the splitter slot and the blade slot as thick as possible.